What would it take for you to doubt your best friends? 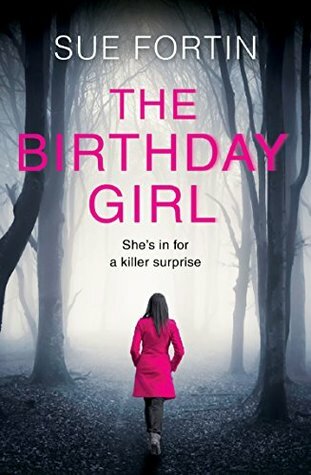 This question is put to the ultimate test in The Birthday Girl by Sue Fortin. The book begins with the group of four friends, Carys, Joanne, Andrea and Zoe. It is approaching Joanne’s fortieth birthday, so she invites the girls for a weekend away together, being very vague about the details and suggesting it as more of a mystery trip. Joanne is a master of dramatic effect, and kicks off the journey by arranging a driver to pick up the other three girls, confiscating their mobile phones and making sure that they can’t work out which direction they’re headed. This is frustrating, but the others are used to Joanne’s games and plan to have it out with her when they arrive, especially as most of them have children they want to check up on. However, when they arrive at the house, it is clear that there won’t be any phone signal as they are out in the middle of nowhere. In fact, it doesn’t look like anywhere you’d want to spend a weekend, but once there they are stuck for the duration with no transport of their own. Joanne then makes her presence known and continues to play games, giving everyone a card with a famous name on it, which is supposed to represent someone’s secret. Carys begins to suspect that Joanne is after some sort of revenge, but she only knows what her own secrets are and not what the others are hiding. However, there are some secrets which should never be told, and someone doesn’t take kindly to Joanne’s petty games, prepared to go to any lengths to make sure their secret never comes out. I really enjoyed this book, as it was a little different to your normal thriller, with the action being somewhat contained to one friendship group and the dynamics between them. It made you wonder at how quick they were to doubt or become suspicious of each other, and whether the secrets they’re harbouring are related to their behaviour. Joanne’s motive for organising the trip is also one big mystery, as she is portrayed as a game player from the very beginning, but everyone seems happy to go along with her plans. It is Carys who is our main eyes and ears throughout the book, with it tending to be her opinions on the other characters that we are influenced by. She has suffered her own share of heartbreak, with her husband having committed suicide and her son having taken out his anger on her ever since. She could do without Joanne’s comments about her parenting, with her son having spent more time with Joanne than with her over the last few months. However, as events take a darker turn, Carys is the only one capable of keeping her head together, providing a voice of reason in amidst the chaos. I quite liked Carys as a character, but at the same time you are always aware that she is hiding something, making it difficult to trust her narration and really get behind her. This made it difficult to enjoy the story, as I was always waiting for the big reveal and frustrated at how long we were having to wait. Admittedly, as the suspense builds I was desperate to keep reading, keen to find out what would happen next, especially as the isolation leaves them all exposed and prone to making mistakes. This was an intriguing thriller with several twists and turns that will keep you engaged throughout, especially once the scene is set at the cottage. I think the author does a good job of throwing in some unexpected twists, and the ending in particular is sure to stay with you after the final page.